Bahria Town has entered Karachi with a number of residential and commercial projects, but the never-ending appetite of the developer for development projects does not seem to be letting up any time soon. Bahria Town recently sponsored the construction of Altaf Hussain University in Hyderabad and now it is planning to provide Karachi with a Bus Rapid Transit (BRT) system, a project that is likely to ease the immense pressure of traffic in the city. This news might raise an eyebrow or two because technically speaking, the government should be undertaking this project instead of a private developer like Bahria Town. Nevertheless, the residents of Karachi are likely to be stoked once the project reaches fruition one way or another. While talking to reporters at Bahria Icon Tower in Karachi, former Bogotá, Columbia mayor and urban city transport systems expert Mr Enrique Penelosa said the BRT was the only way to address Karachi’s traffic mess. The Bahria Town management has reportedly asked Mr Penelosa for his expertise to help accomplish this feat. According to a news source, the BRT will pass through MA Jinnah Road and will reduce the time required to travel to central Karachi by half. Mr Penelosa also said that in the next 60 to 70 years, the population of Karachi would spike to 70 million and it would not be possible to make a traffic plan for the city. 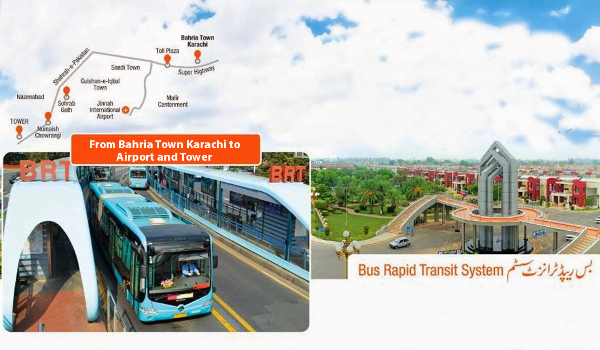 The introduction of the BRT is likely to increase Bahria Town’s standing in Karachi and might also bolster the public’s confidence in Bahria Town’s projects. But the fact that a private developer is undertaking a development project that is usually executed by governments across the world is something that is not easy to stomach, and I for one am going to keep a keen eye on how things unfold on this front. I leave this discussion open for you in the comments section below, and might I request that we approach this with cautious optimism instead of our usual keenly critical eyes?